← Where should I dispose of my Rainbow vacuum water basin’s contents? Posted by Steve Morgret on September 30th, 2013 20:22pm in Rainbow Vacuum Accessories. Last Updated on October 19th, 2018 01:30am. Rexair cleaning systems are renowned for picking up minute particles. But every now and then, Rainbow Vacuum Hoses can get blocked by somewhat larger debris. It’s unlikely that anything big enough to block the hose will ever get by the brush rollers in its own rite. However, build-up of carpet fuzz and pet hair can dramatically reduce suction. They’re called the complete cleaning system for a reason. By inserting the hose into the rear vent on one end and the other end to the intake, any debris restricting airflow can usually be dislodged with minimum fuss. 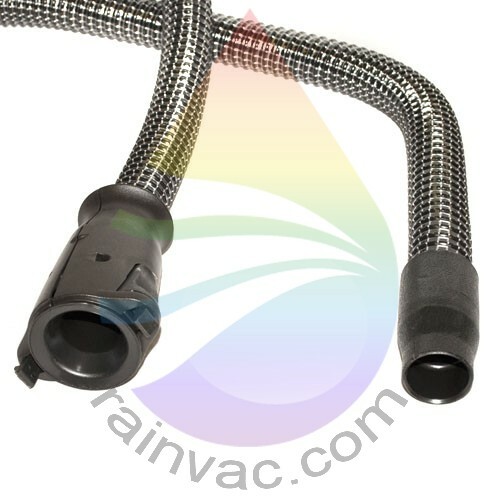 In today’s article, we’re going to explain exactly how you can use the Rainbow Vacuum Hose to literally cleanse itself, leading to optimum suction at all times. The Rainbow Vacuum cleaning system works on two basic premise: water & HEPA filters work in conjunction with powerful, bagless suction to deliver unprecedented cleaning power. The color of the water in the basin is an obvious indicator as to how well the first part of the equation is functioning. With unrivaled cleaning power, inky-colored water is even expected. This is especially true during the first few times you put your new Rainbow vacuum to the test. A sudden loss of suction in your Rainbow Vacuum Hose, however, isn’t a normal realistic expectation. Nor is the cause as immediately apparent. Before you begin panicking about motors, you may well have a simple blockage. Safety first: turn the power off completely. Next, detach the hose from where it joins the canister, the intake into the water basin at the front of the unit. Turn the vacuum around and you will see your rear vent door, towards the bottom of the unit. Remove the door completely, giving you access to the exhaust. Here’s the clever bit. Connect the end of the Rainbow vacuum hose you’ve taken out of the intake to the exhaust, and be sure to feel for the two click from the latches on the hose. We stress Rainbow for a reason. There are generic hoses available. However, 90% don’t attach as well and can tear very easily compared to the genuine parts. Neither are they as robust nor contain the stretch-resistant nylon strands Rainbow use. But we digress; back to unblocking your hose. Detach your hose handle from the wand and move on back around to the front of the canister. Where the hose attachment would normally attach to the intake, insert the open end of the handle directly into this area. Now, turn the Rainbow on. The high-performance motor that the Rexair Company is renowned for should issue a whoosh out from the rear vent, travel at speed along your Rainbow vacuum hose and dislodge the blockage, sending it directly into the water basin. You can then dispose of the blockage when you are finished cleaning or need to replace the water. remember to re-attach the rear vent door before you turn the vacuum back on to resume cleaning. If this quick fix doesn’t work for you, you can either refer to your manual for other possible solutions or call us for our expertise. If the worst happens and it’s untenable to carry on using it, we carry replacement Rainbow vacuum hoses from 7′ to 30′ so you can get back to cleaning again in next to no time.